Download individual articles by clicking their respective titles. 1. "Isolationism, Internationalism, and the USA’s “America First” Policy in Historical Perspective"
2. "An Inquiry into the Competitiveness of the Trump Administration’s Protectionist Trade Policies: Towards Inbound Investment Policies"
3. "Re-Examining the Viability of the ROK-U.S. Alliance: Can the Alliance Survive the ‘Illiberal Hegemony’ of the Trump Era?" 4. "A Comparative Analysis of South Korean vs. Indian ODA Strategy in Africa: The Case of South Korean Engagement in Ghana and Rwanda"
"Despite South Korean aid to Africa increasing, studies on Asian middle powers’ influence on the continent has primarily focused on China and Japan. South Korea’s ODA to various African states has increased substantially since the late 2000s; however, it continues to receive little public or academic attention. This study explores the motivations behind South Korea’s increasing engagement in Africa with a focus on Ghana and Rwanda as case studies. Furthermore, the research provides a comparative analysis of South Korea’s engagement with Africa to that of India, another rising Asian middle power and a significant donor in Africa. This study uses secondary data sources to critically analyze and evaluate academic literature, reports, books and online newspaper publications to provide insights into the nature of South Korea’s development assistance programs in Africa. The study suggests that South Korea’s ODA allocation to Ghana, Rwanda and other African countries is influenced by the needs of the recipient countries as well as South Korea’s need to secure national security interests and attain greater global status. While South Korea and India’s development assistance programs in Africa are dominated by commercial and natural resource diplomacy, both countries are competing against one another and other Asian powers, like Japan and China, for access to Africa’s raw materials and to secure new markets for companies at home. 5. "Populism as a Threat to Democracy: Drawing Parallels of Populist Elements Between the Presidential Campaigns of Donald Trump (United States, 2016) and Prabowo Subianto (Indonesia, 2014 and 2019)"
6. "Trilateral Development Cooperation in North Korea: The Beginning of Regional Development Cooperation in Northeast Asia"
* Note: Manuscripts annotated by an asterisk indicate a thematic article relating to this issue’s soft focus of Changing Dynamics in East Asia. "The design of Olympic identity programs is informed by the ideological function of the Games. The idealism of early globalization is reflected in the graphic modernism that reached a high point with Otl Aicher's identity program for the 1972 Munich Olympics. More recent programs, however, have exchanged modernist idealism for local differentiation. The one exception to this trend is the design program for the 2018 Pyeongchang Winter Olympics, which, I argue, represents a momentary return to the idealism of an earlier age"
2. "Palen, Marc-William, The “Conspiracy” of Free Trade: The Anglo-American Struggle over Empire and Economic Globalization, 1846 – 1896"
Keywords: Marc-William Palen, Cobdenite Cosmopolitanism, Listian Nationalism, Imperialism of Economic Nationalism, Gilded Age. "In The “Conspiracy” of Free Trade, Marc-William Palen traces the ideological debate over the proper course of economic policy, taken place between the Cobdenite cosmopolitans and the Listian nationalists during the Gilded Age. With professional students of social sciences rather than historians in mind as potential audience, this book review introduces TCFT in detail and examines the author’s central concept, “imperialism of economic nationalism.” According to the author, the U.S. experience of economic globalization during the latter half of the nineteenth century reveals that protectionism can be associated with imperialism as easily as it can combine with autarky. The book review also examines the book’s methodology, and illuminates future research agenda for imperial and intellectual historians alike." 3. "Economic Interdependence and Peace in East Asia: The Role of Regional Organizations"
"This research investigates and describes economic interdependence and regional peace in East Asia in the period 1967 to 2016 based on a liberal framework. This study seeks to examine how economic interdependence decreases the severity of military conflict among ASEAN, ASEAN+3, and EAS member-states. Quantitative analysis with regression modeling was used as the primary research methodology, and the result suggests that increased economic interdependence is a key driving factor of peace among the member-states of ASEAN, ASEAN+3, and EAS. Nonetheless, an increased level of democracy does not affect the severity of military dispute in East Asia, nor is the intra-regional trade among ASEAN countries large enough to contribute to the peace among its member states. This paper presents the idea that trade disputes in East Asia would increase the security tension among East Asian countries, as the results suggests economic interdependence is a key driving factor of regional peace among ASEAN, ASEAN+3, and EAS member-states. Since little research on peace in East Asian has been conducted through quantitative methodology, this paper would be able to uniquely contribute to the richness of the discipline of security studies." 4. "Free and Open Indo-Pacific Strategy: Accurate Diagnosis, Imperfect Prescription"
"In his landmark book The End of History and the Last Man, political philosopher Francis Fukuyama contended that the end of the Cold War marked the end of this ideological battle in mankind’s history. Liberal democracy had prevailed as the final ideological stage of human evolution, and although there would be sporadic, regional tyranny and authoritarianism, the global trend would overwhelmingly head towards Western-style democracy. However, the 21st century witnessed a seemingly unsustainable governance model in China, where the economy is largely liberalized but political power remains in the hands of the Communist Party. Two decades after exponential economic growth, Beijing has risen as a powerhouse that contends American hegemony both geopolitically and ideologically. Systemic failures of popular democracy, from the chaotic Arab Spring in the Middle East to the alleged Russian interference in the U.S. Presidential election, buttress the Chinese challenge to the Post-World War II liberal order. So far, the American response to China’s rise has been limited by aspirations for cooperation. With China’s growing influence on virtually every continent, the Trump Administration’s Free and Open Indo Pacific Strategy provides a strong framework to curb China’s ambition. However, the strategy needs to maintain room for areas of cooperation. It would be in Washington’s interest to bolster key alliances and partnerships on trade, maritime dispute, and preservation of the liberal order. The dynamic between Washington and Beijing is arguably the most important bilateral relationship of the century, and the FOIP strategy will greatly shape their great power relations for years to come." "China’s single party state has received a high level of popular support despite the many protests against its local governments and its authoritarian-style governance. There exist many scholarly debates on how the CPC maintains its resilience. Some suggest a high level of state oppression, while others emphasize Chinese society’s lack of mobilization potential. The purpose of this research is to help explain the CPC’s resilience in the face of protest, particularly focusing on state behavior. To this end, the following paper examines the case of the Wukan conflict by disaggregating the incident into a series of events and employs comparative data analysis to support its hypothesis. The study demonstrates that the central government portrays itself like a ‘good cop’ by shifting criticism to local governments, which it frames as a ‘bad cop.’ Analysis shows that this ‘good cop bad cop’ relationship is maintained in an institutionalized manner, through clear demarcation between central and local governments, as well as salient role differentiation. These findings are applicable to various fields of study. For example, it provides useful implications for understanding the future of China’s authoritarian regime by suggesting that the maintenance of the central-local ‘good cop bad cop’ relationship is a fundamental behavioral institution the CPC relies on, both to manipulate its image in a positive way as well as avoiding negative attention. Consequently, the paper presents this central-local structure as an explanatory variable for the CPC’s authoritarian regime resilience." "In the face of the volatility in the East China Sea, marked with the rise of assertive China, Japan’s decision to militarize the region in 2014 and 2015 under the Abe administration represented a significant shift in its foreign policy orientation. This paper will analyze Japan’s militarization of the East China Sea, with particular focus on its consequences and implications. The paper is conducted as a qualitative phenomenological study, which draws upon existing relevant literature and a wide range of primary sources such as statements and speeches of Japanese key political figures as well as officials of other countries concerned. As opposed to the objective illustration of particular events, the primary sources illustrate the growing first-hand threat perceptions among the Japanese policy-makers who found themselves trapped in the destabilizing regional environment, which compelled them to embrace the hardline approach. 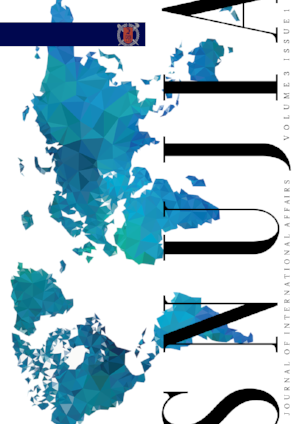 This paper demonstrates that Japan’s militarization not only failed to achieve the Abe administrations desired outcomes, but also culminated in worsening Japan’s diplomatic ties with its neighboring states and generating a regional security dilemma. This examination is useful for understanding how Japan’s militarization contributed to forming the current volatile security situation in East Asia, especially in its relation with China. Additionally, Japan’s militarization is representative of its changing foreign policy orientation toward China, which is becoming more confrontational and uncompromising. The originality of this work lies in the use of unfiltered perspectives and voices in Japanese political sphere, documented in primary sources." 7. "The Impact of Media on U.S. Policy in Korea from 1945-1950: The Portrayal of Syngman Rhee"
"At the end of the Second World War, there was little American interest in Korea. Most Americans wished for their soldiers to return home and focus on domestic issues. However, by the time the Korean War erupted, public support for a U.S. presence in Korea increased remarkably. There are many factors that contributed to this increase in public support, and the role of the U.S. media is a major one. By downplaying the negativity surrounding U.S. operations in Korea, U.S. media helped to maintain public support for a U.S. presence in Korea. With few concerns about U.S. operations in Korea and a new enthusiasm to confront the communist threat, Americans had little reason to protest U.S. operations in Korea. This article is the first in a series that analyzes the impact of U.S. media on U.S. Policy in Korea. This first article analyzes the case of Syngman Rhee, the first president of the Republic of Korea. The data accumulated shows that there were considerable discrepancies between U.S. newspapers and government documents concerning the characteristics and activities of Rhee. Furthermore, information from government documents suggest that the downplaying of negativity surrounding the Korean situation in U.S. media may have directly benefited U.S. policy on the peninsula." "Scholars from international relations, communication and other related fields discuss the importance and place of Cultural Diplomacy (CD) as a foreign affairs tool. CD is a domain that has been explored by few scholars so far is is on the Intangible Cultural Heritage (ICH) list, by the and was initiated by the United Nations Educational, Scientific and Cultural Organization (UNESCO), where CD is applied and practiced. This paper explores the case of relations among China, Japan, and South Korea as state parties of the Convention on ICH initialized by UNESCO in 2003. The given case study examines CD of the three countries as ICH state parties in terms of the three main areas of their activities: the nomination and inscription of the intangible heritage; the development of ICH in the region and worldwide through providing facilities; and financial assistance to the ICH Fund. The analysis demonstrates that all three selected countries demonstrate collaborative and competitive CD. At the multilateral level, the selected countries conduct cooperative diplomacy while at the bilateral level, countries tend to apply competitive diplomacy. I conclude that the existing ICH legal and procedural framework, as well as the misperception of the values and aims of ICH by the state parties’ governing bodies encourage countries to cooperate and compete. The study is useful as a demonstration of how an international structure like UNESCO’s ICH that pursues good governance and universal values can turn into a battlefield for political competition among the most active member states. The author suggests changes in the legal framework of ICH to encourage non-state actors’ participation and cooperation among the selected countries."